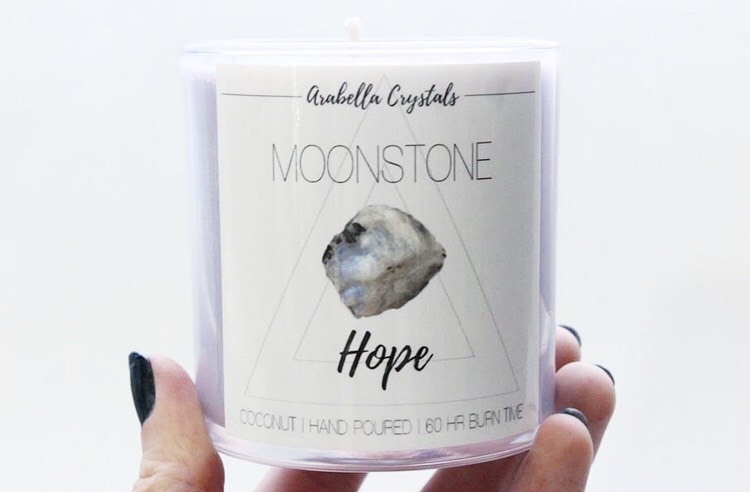 One treasured item in this box is the coconut scented soy Moonstone Candle from Arabella Crystals that reveals a hidden moonstone as it burns. So you can soak up the magic of this candle until its last flicker and beyond, we have Alicia Siebert, founder of Arabella Crystals, here to elucidate us on the healing energy of moonstone. Rainbow Moonstone is a transparent Labradorite that's closely related feldspar mineral. It is a milky white, iridescent stone with shimmering hues of blue, purple, and sometimes warmer hues of yellow and orange. It gets its shimmer from a property of gemstones known as adularescence. 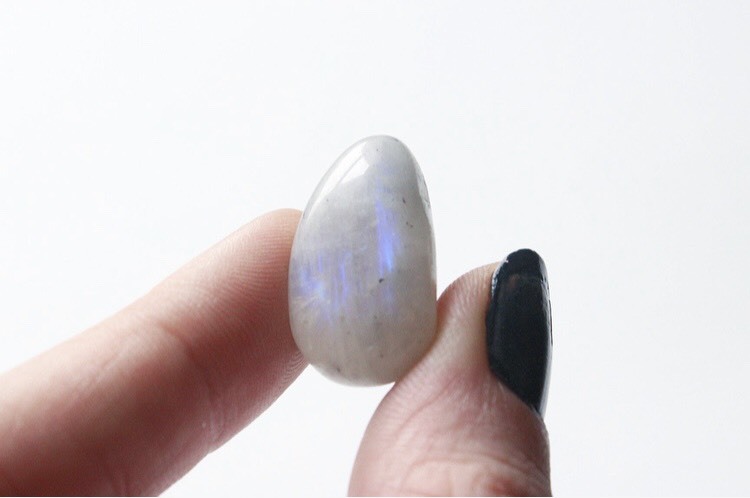 Energetically, moonstone can strengthen your connection to your inner goddess by amplifying your intuition, dreams and feminine energy. Holding Moonstone and gazing into its swirl of colors and white light can bring the mind, body, and spirit closer to serenity. As an incredibly high vibrational stone, when Moonstone is used during meditation, it can bring you closer to your higher inner-goddess and increase psychic abilities. As a promoter of hope, confidence, and faith, moonstone is a key tool to help you achieve your dreams. Moonstone's drive to embrace success goes hand-in-hand when letting your intuition take the wheel. Trust. Allow. Receive. This beautiful stone strengthens woman-hood, helps you embrace femininity, and aligns you with your natural rhythm. The pearliness of the stone holds the resonance of the moon making it a wonderful tool to include in all of your moon related rituals. First, light your Arabella Crystals Moonstone candle (included in the Goddess Provisions Moon Muse Box - SOLD OUT). The candle's lilac color represents peace, healing, and intuition. The coconut scent will help you feel relaxed, carefree, and clean. Next, close your eyes and imagine yourself on a quiet beach. Feel your breathe slow down as you draw your focus to the rising moon. Watch as the moon grows larger and listen as the waves roll in closer to you. The moon is offering you something. Think about it, embrace it, and let the moon take control. When you’re aligned with the moon and its tides, your actions will be enlightened and inspired. Remember that everything happens energetically before it occurs physically. Alicia Siebert founded Arabella Crystals when she was 17 years old with the desire to provide like-minded spiritual individuals with an array of healing crystals and eco-friendly soy candles. Each candle is hand-poured, scented with fine fragrances and essential oils and contains a crystal inside. All Arabella Crystals' creations are infused with the energetics of sacred geometry, the zodiac, crystals and chakras.